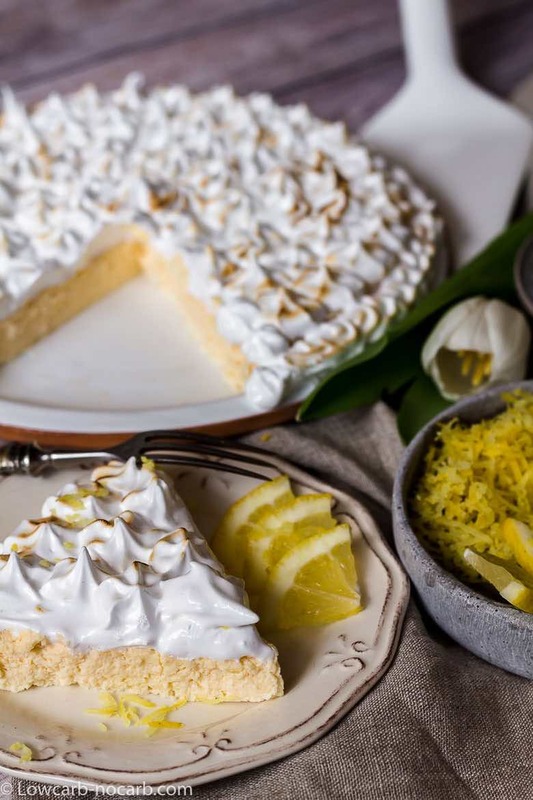 Pretty easy to make, this Instant Pot Keto Lemon Cheesecake with Sugar-Free Meringue Icing is so soft and extremely delicious just perfect for our low carb living. 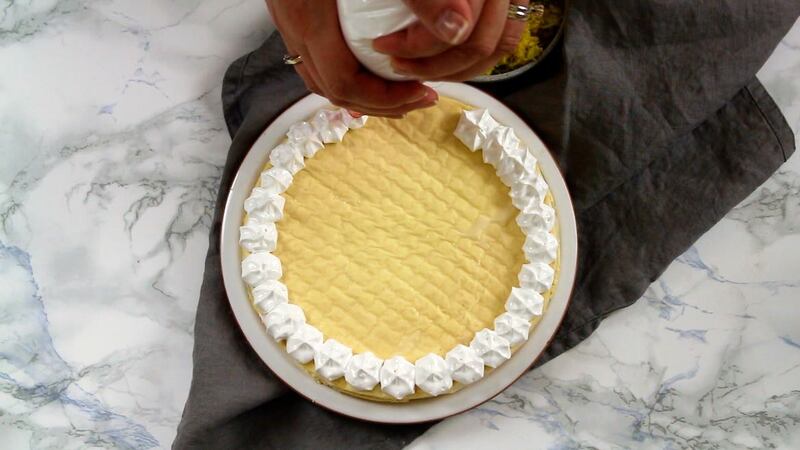 Sugar-Free Swiss Meringue icing adds a perfect finish to the Keto Lemon Cheesecake and mixes the sweet and sour flavors together just as we would wish for. 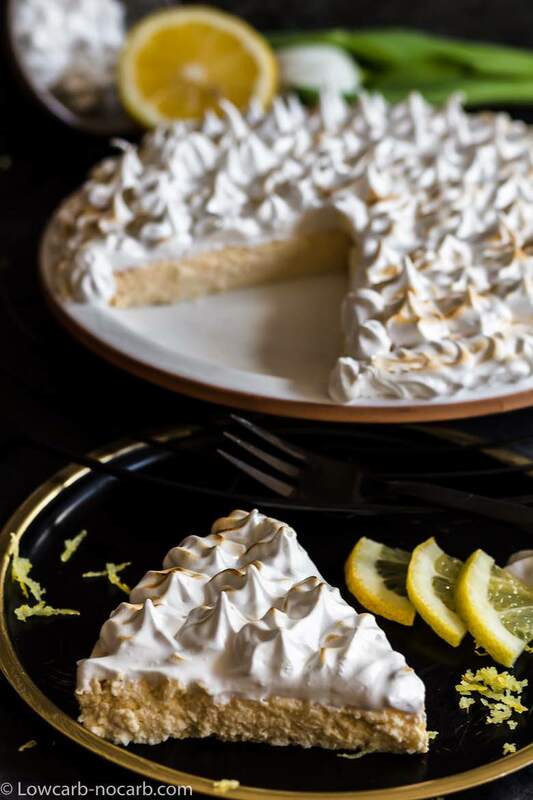 In this post, you will learn everything about how easy it is to make this wonderful fully flavorful Instant Pot Keto Lemon Cheesecake with Sugar-Free Swiss Meringue Icing. 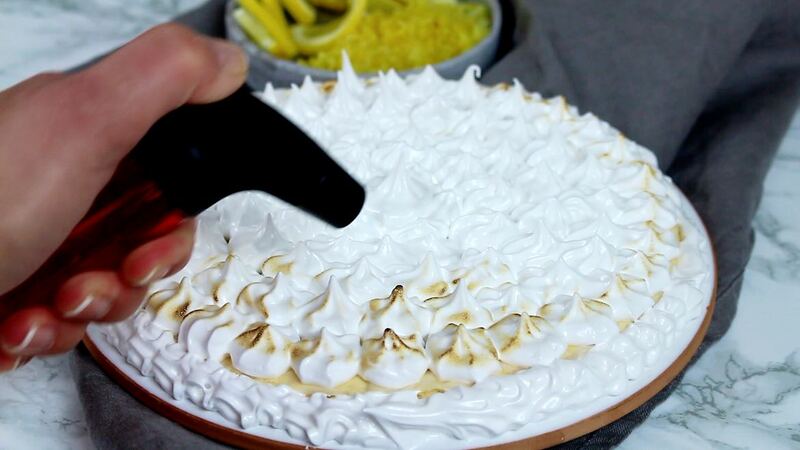 Fourth Step: Use Blow Fire Torch to give the Sugar-Free Swiss Meringue Icing the finishing touch. How to make Keto Lemon Cheesecake? The reason I love this Keto Cheesecake is the extreme easiness involved. You really do not need thousands of difficult steps for it. All you do is mix ONLY 4 ingredients together and place it into the Instant Pot. Just simply take Yogurt with sugar sweetener of your choice and mix it together. Add one Egg and lemon juice and you are done. You can make your own Keto Greek Yogurt in an Instant Pot with our recipe. How do you use Instant Pot for Keto Cheesecake? Making a Keto cheesecake in an Instant Pot is one of the easiest solutions. All you have to do is to place the mixed cheesecake into the Pot, switch on the High Pressure for approximately 25-40 minutes (depending on how big and thick your cheesecake is) and you are done. 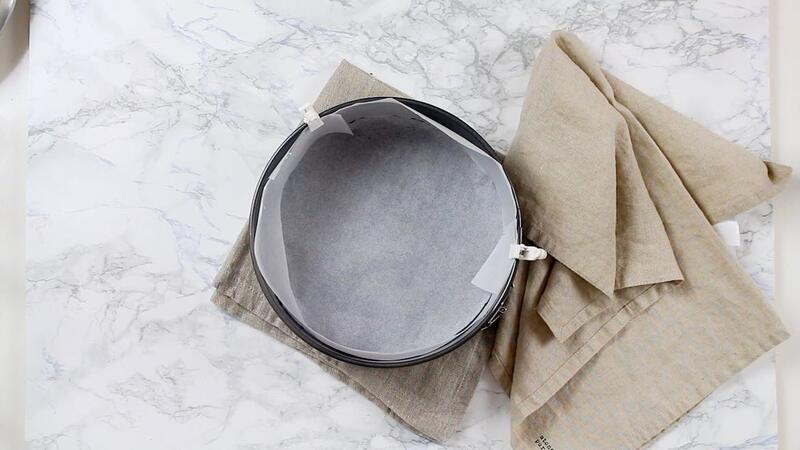 Line your baking pot with Parchment Paper from inside and on the sides. This helps big time in the end when the cake is done. You will not only have very little cleaning involved afterward, but the Keto Cheesecake will stay fully intact and beautiful once served. All you do at the end is slowly peel the parchment paper from the sides and bottoms and you are done. Please do not forget this step. I can say this from my own experience. I have once made it fully and completely forgot to take the parchment paper from the bottom. The reason is, that I have used white colored one and while baking it became completely see-through and unseen. And the best part is, that now I know I am the owner of pretty sharp knives. I have not realized anything even by cutting the cake. Only later while my daughter was eating it, she has mentioned there is some Paper. I could not believe it I have forgotten that small point. But at the same time, I was glad it was the cake only for us and not some visitors or friends. How embarrassing that would be. Before placing the Keto Cheesecake into the Instant Pot add at least 2 cups of water in. By pressurizing it, the water evaporates really quickly. Again from my own experience, I have once added only one cup of water and left home, let the Instant Pot do its own thing. Came back home with Instant Pot showing BURN on the display. First I was really shocked and got scared about what has happened. I actually thought the whole Instant Pot has been burned and I can just throw it. But then on the other side, when I have realized what has happened I was pleasantly surprised. I was so glad I have the Instant Pot and not some other Pressure Cooker, which will probably just blow out as I have heard. Pretty clever this Instant Pot is. It just stops working once the water has evaporated and nothing happens. Once you place the mixture into the baking dish, make sure you tightly close it with aluminum foil. I also place 2 sheets of white tissue underneath to take out as much humidity as possible. Have a look at the video for better understanding. Once the cheesecake is baked and I am ready to place it into the fridge, I will replace the tissue with the new and dry one. 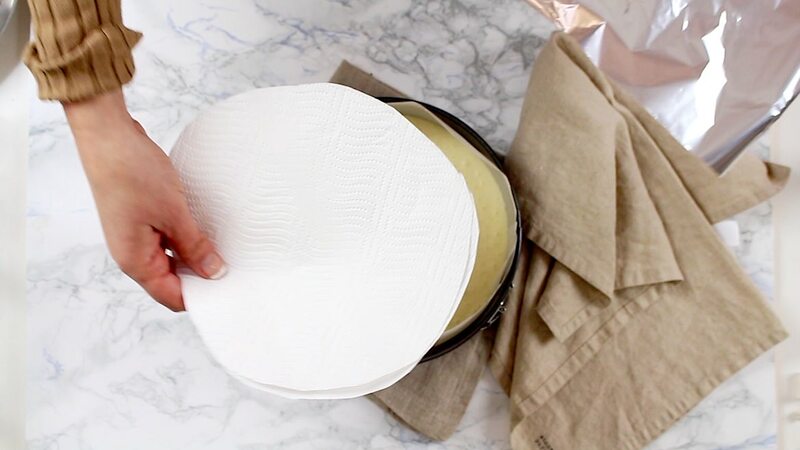 Do not forget to make a sling out of the aluminum foil for you to be able easily to place and remove the baking dish into the Instant Pot and afterward out of the Instant Pot. Have a look at the video to see how. Can you make Keto Lemon Cheesecake in the oven? 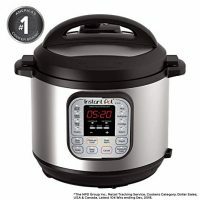 That is another option if you do not have an Instant Pot. I mean Instant Pot is really great and I would recommend it to purchase 100 thousand times. But. But I have also lived without it for so many years and nothing really happened. You can use the same steps and the Keto Lemon Cheesecake will be baked in the oven. 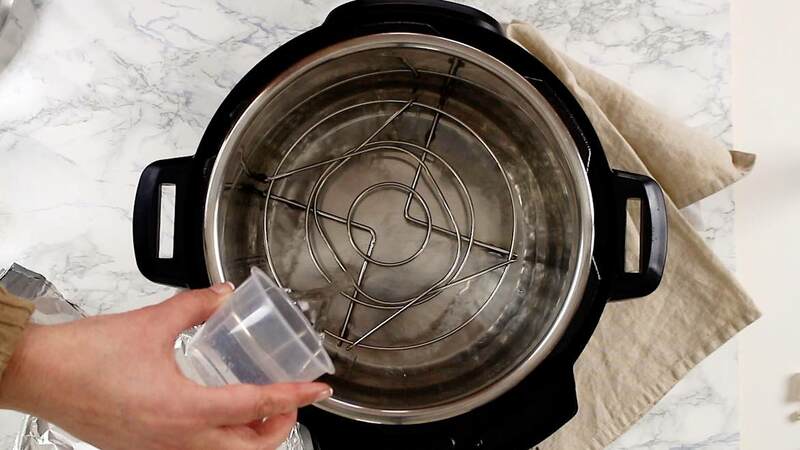 Make sure the baking dish is placed in the bigger baking sheet, which you fill with water to get the same effect as you would from the Instant Pot. Additionally to that keep it in the oven for at least 40 minutes to have the Cheesecake baked fully and properly. Everything else and all of the other steps stays the same. How to store Keto Lemon Cheesecake? Once all is done, this cheesecake stays in the fridge for a pretty long time. Since it is cooked, you do not really have problems with eggs or yogurt becoming old. 3-4 days, sometimes even 5 is pretty ok.
Just make sure whatever topping you choose, is only added later on. Like for example if you use fresh berries, those need to be eaten or taken out. Otherwise, you will end up on the 4thday with rotten berries and you can throw the whole cake into the dustbin. Can you freeze the Keto Lemon Cheesecake? The portion I have made with this cake is pretty small and therefore I do believe, it gets eaten before you should be worried about storing it. But in any case, if you do want to place it into the freezer, do it without worry. I would suggest to pre-cut the cheesecake and separately pack it, so you do have an option taking out just piece you need at that moment and you would not have to unfreeze the whole lot. Also, freeze it without any toppings. It is much easier to store and pack. And every time you take a piece out, you can have a cheesecake of your choice. Every day you can have it with a different topping. Also another advantage. Don’t you think so? I have made this Sugar-Free Meringue Icing on several occasions. Used the exact same steps with our Sugar-Free Meringue Cookies Recipe. Also, have made Pavlova cakes with the same steps. With our Keto Lemon Cheesecake, I have decided to not bake it and use it fresh as it is. You do need a liquid sweetener for this step. My best recommendation is Sukrin liquid sweetener, which is see-through. 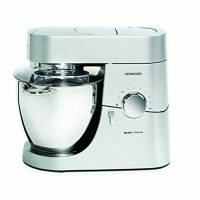 It needs to be properly mixed in the water bath and then subsequently placed into the Kenwood Mixer or any other Machine you have at home to get the proper fluffiness and structure. Once done fully, place it into the icing piping bag with the tip of your choice and pipe it onto the cake. If you do not have the tip or a piping bag, that is not a problem at all. Just take a Ziploc bag or any bag and with scissors cut the small tip at the end. You will get almost the same results. Third Step: Assemble the Keto cake and Sugar-free icing together. Now it is the time to put it all together. 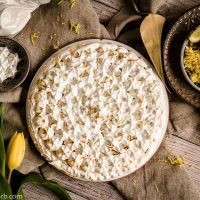 Keto Lemon Cheesecake and Sugar-Free Meringue Icing. 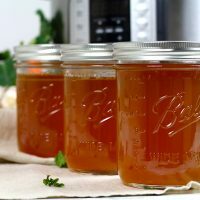 If you have followed all of the previous steps, you should have them both ready and fully cold to get the best results. 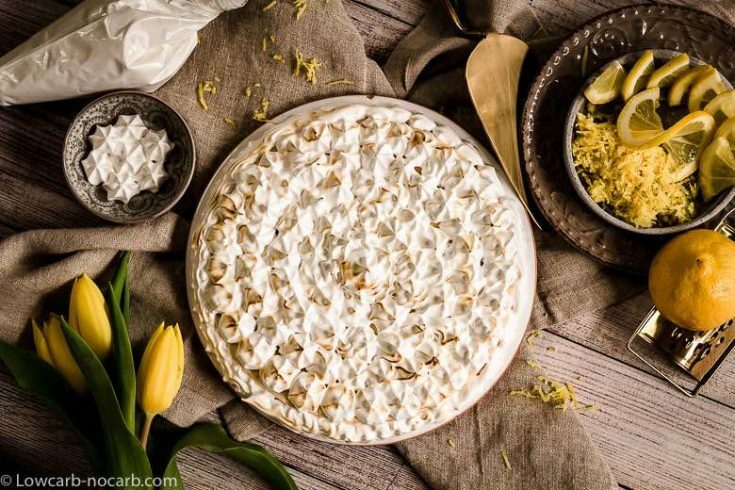 Place the Keto Lemon Cheesecake on a plate you are planning to serve it on and with piping bag start piping the Sugar-Free meringues Icing. I would suggest to start with the outer round and slowly getting into the middle. For the best explanation, please have a look at the video provided, since I do believe once you see it, it is the best to understand. When the whole top is covered, make one more round of icing onto the whole side of the cake. This will cover the whole Keto Lemon Cheesecake and you will be left with a beautiful cake with an invisible surprise inside. 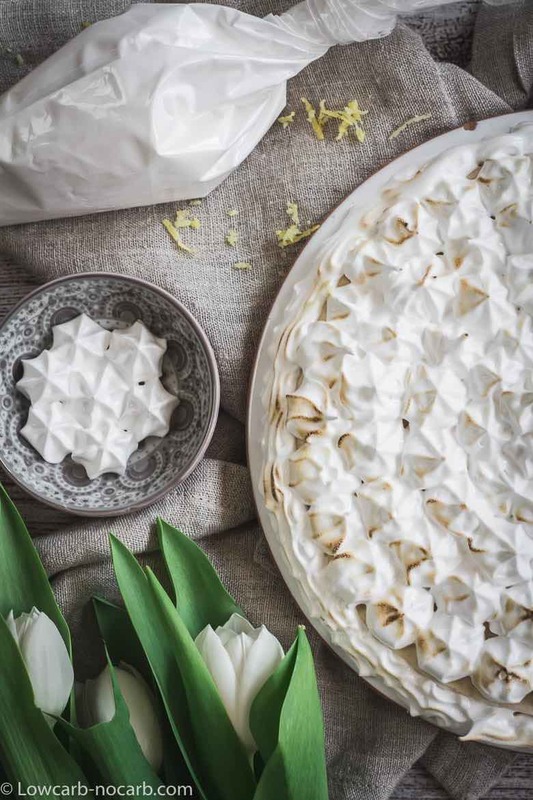 I have chosen the Sugar-Free Meringue Icing for this recipe for one reason. I strongly believe those 2 flavors compliment each other just perfectly. Sour taste coming from a lemon cheesecake and sweet taste from Meringue gives you just the right touch. Fourth Step: Fire Blow Torch to give the Sugar-Free Meringue Icing the finishing touch. This step is really optional. You do not have to use it, but I believe it gives the whole cake a beautiful rustic finish touch. I just love the tiny burned tips on some parts of the cake. 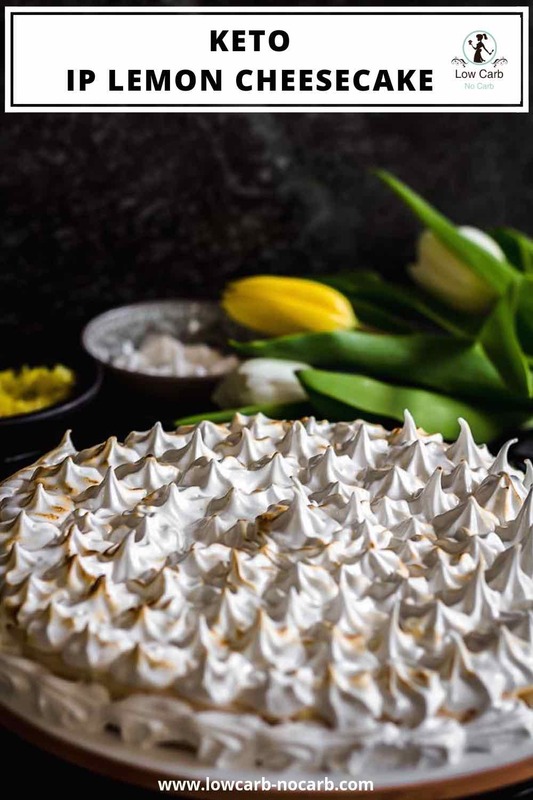 How do you use Crème Brulee Blow Torch On the Meringue Icing? As you see on the video I have used a simple few dollars Flame Torch you normally use for making a Crème Brulee. Make sure you hold the Blow Torch few centimeters from the cake, so you do not end up with the big extremely burned tips. I would suggest to try it on a separate plate. Once I am piping the icing, I make sure to pipe one or two small tips on a different plate to see how thick or thin I want the design to be. The same plate I then use to try my Flame Torch. This way, I have made the trials and make sure what comes onto the cake is tested already. This is it. You should now enjoy the cake with your friends or family. I am sure you will fall in love with it and will make it again and again. If you would not want to miss any of the new recipes coming from us, do not forget to register to get our regular Newsletter. And now it is the time for a full recipe with instructions, which you can as well print it for your own convenience if you wish. 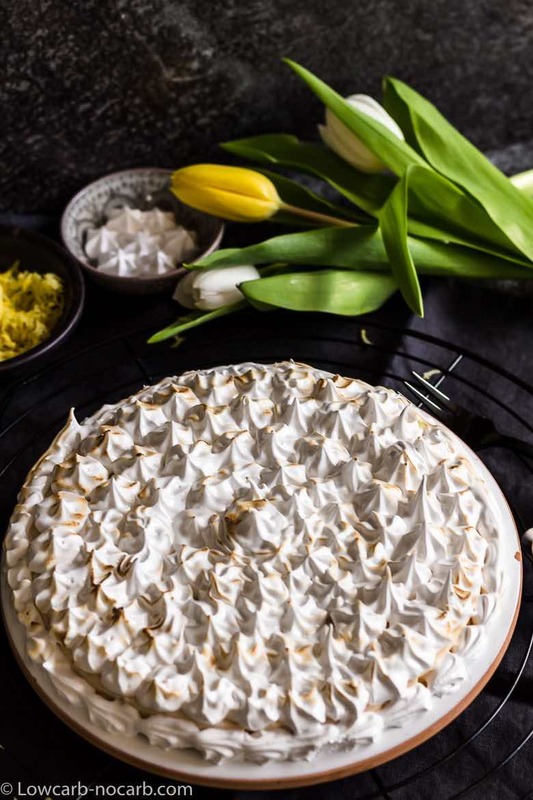 I am sure with this proper explanation and the video with steps attached to this, you will have no problem at all to make the best ever Instant Pot Keto Lemon Cheesecake with Sugar-Free Swiss Meringue Icing. Questions about Keto lemon Cheesecake? But if you do have any question, please do write to me and I will be happy to answer them and help. Pretty easy to make, this Instant Pot Keto Lemon Cheesecake with Sugar-Free Meringue Icing is so soft and extremely delicious just perfect for our low carb living. 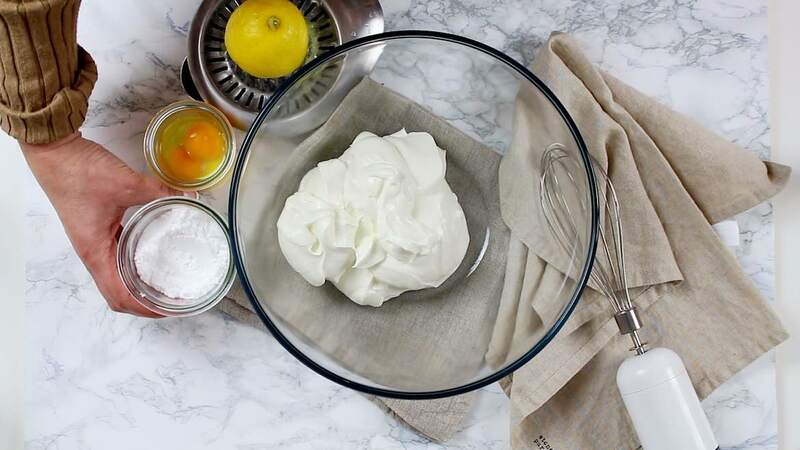 Sugar-Free Swiss Meringue icing adds a perfect finish to the Keto Lemon Cheesecake and mixes the sweet and sour flavors together just as we would wish for. 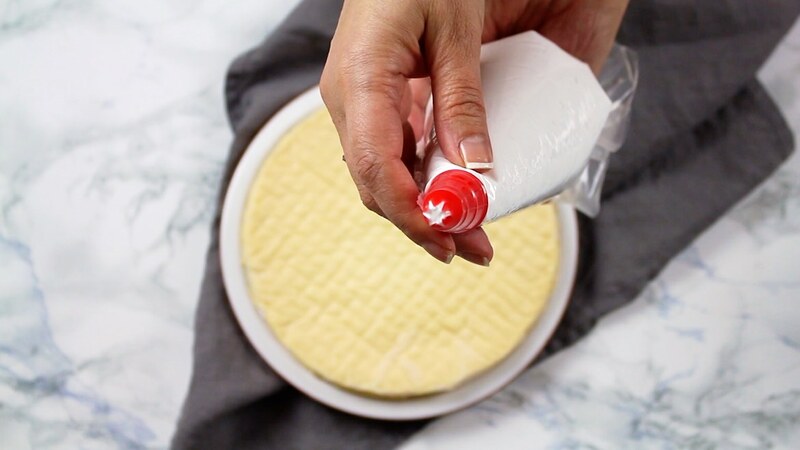 Once the Cheesecake is baked, take it out of the Instant Pot, let it cool a bit and replace the paper towel with dry one to take more moisture out. As per the video or fully explain steps above in the post, start piping the Sugar-Free Swiss Meringue icing onto the keto lemon Cheesecake starting from the outer side. Optional: Take the Fire Torch and from few centimetres fire it onto the tips of the icing to achieve the rustic brown burnout tips. This time my whole post is filled with entire instruction manual on how exactly to make this wonderful Cake. 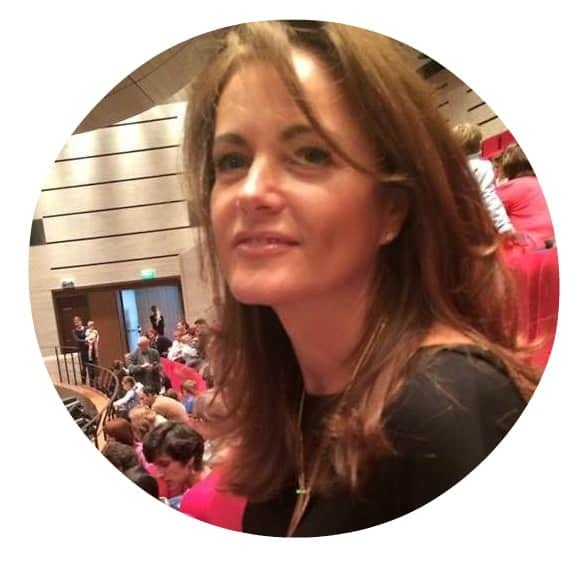 I have included tips and suggestions, and therefore would advice to read the whole post. 65 mouth-watering Keto dessert recipes in a digital, interactive cookbook that’s sent out via email immediately. All recipes are Keto, low-carb, sugar-free, Paleo, dairy-free and low-inflammatory using gluten-free ingredients. Easy-to-make with easy-to-find ingredients. Full nutritional info is provided for every recipe. A bonus easy-to-print version is also included. 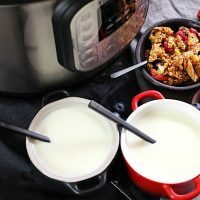 Perfectly easy to make this homemade Instant Pot Keto Cold Start Greek Yogurt is done in no time using your one and only Instant Pot. Soft, rich, creamy extremely tasty and a big part of our Low Carb living, this gluten-free, diabetic-friendly and healthy Greek yogurt could be used for cooking, baking, breakfast, dinners, whatever you desire to. 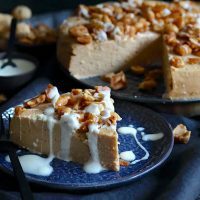 Quick and easy to make this homemade​ and healthy Keto Peanut Butter Cheesecake in an Instant Pot is without the base for your immediate sweet craving.